Summary: Allie's excited about her class field trip. Sure, it's to a historic one-room schoolhouse, built back before there was the Internet or even cell phones, and Allie's teacher is encouraging everyone to dress up in old timey costumes, which some of Allie's friends are actually doing. But at least she gets to ride on a bus, which she never gets to do, living so close to school that she actually has to walk there every day! But then Mrs. Hunter announces that every student in Room 209 has been assigned a "buddy" for the day--from Allie's old 4th grade class at Pine Heights Elementary--and her buddy just happens to be her ex-best friend Mary Kay, who betrayed Allie right before she moved! Allie is going to have to spend a whole day sharing an old-timey desk with a big crybaby! 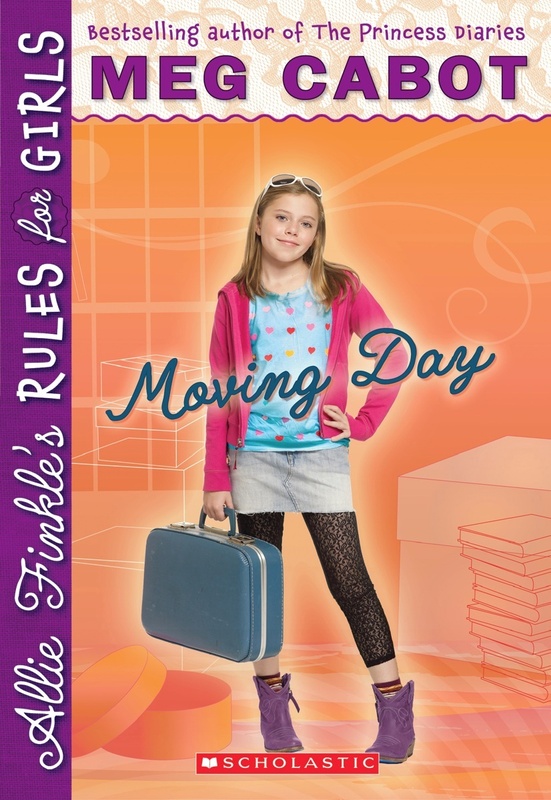 Last year, Booking Daughter selected ALLIE FINKLE'S RULES FOR GIRLS: MOVING DAY by Meg Cabot as one of our Mother-Daughter book club picks. Booking Daughter is a HUGE fan of Meg Cabot's and couldn't wait to share her love for Allie Finkle with her friends. In fact, Booking Daughter has read every Allie Finkle book at least once; and I bet she has consumed some of them up to three or four times! As a mother, I also enjoyed MOVING DAY -- you can read our joint review here. I was pleasantly surprised by how entertaining the book was. Plus I thought MOVING DAY ended up being a great discussion book for the girls. There is even a discussion guide available for MOVING DAY which isn't always the case for many middle grade books. If you are interested, you can read the highlights from our meeting here. So fast forward a year from our Mother-Daughter book club meeting and the sixth book in the Allie Finkle series is now available ALLIE FINKLE'S RULES FOR GIRLS: BLAST FROM THE PAST. I thought Booking Daughter might be a little old for this series, but she immediately snatched up the book and ran to her room -- so I"m guessing not! This Allie Finkle book picks up right where the last one left off; however, it's not necessary to read the books in order to appreciate them -- I've only read the first and last book. In BLAST FROM THE PAST, Allie gets to go on a class field trip to Honeypot Prairie, a one-room schoolhouse and living history museum that re-creates the lives of pioneers settlers. It's not exactly the Children's Museum with a planetarium and dinosphere, but at last it's a field trip where Allie can ride on a bus. However, Allie discovers that her class is sharing the bus with another school, and it just happens to be Allie's old school with her arch enemy Mary Kay. Needless to say, Allie isn't exactly looking forward to this field trip. I thought BLAST FROM THE PAST was a very cute story. I have a feeling that Allie is hilarious in all six of the books, but I admit that I liked Allie a bit more in this story. Of course, I love all of Allie's Rules for Girls and I think so many of them are full of wisdom. But I also liked how Allie dealt with the adversity she faced in this book. I was extremely impressed with Allie's responsible decisions and it appeared that she almost always did the right thing when it came to her classmates. I actually thought BLAST FROM THE PAST brought up a lot of scenarios which are perfect for today's young girls to think about... and discuss! I highly recommend the entire Allie Finkle series, and especially BLAST FROM THE PAST. Meg Cabot has the unique ability to tell a very fun story for young girl while at the same time teaching them some valuable lessons. I have no doubt that girls are going to see parts of themselves in Allie and even relate to her experiences! In BLAST FROM THE PAST, Allie shares so many fantastic messages with the readers. Some of the major life lessons include the importance of friendship, defending other kids against bullies, forgiving those who have slighted you, gaining self-confidence, accepting that you can't change others, and doing the right thing even when its hard. In today's society where some kids can be so cruel, it's nice to see a book that shows kids how important it is to stand up for others. There is a wonderful website devoted to all things Allie Finkle which young girls are going to love. There is information about all of the books in the series including complete lists of Allie's rules. In addition, there are games, videos, and even contests! And for my favorite part, all of the things you need to host your very own Allie Finkle book club including an invitation, book club rules, discussion questions, and an easy cupcake recipe. The site really is a lot of fun and can keep youngsters entertained for hours! Thanks to Big Honcho and the publisher for providing a review copy of BLAST FROM THE PAST. Giveaway alert: I am so excited to share with you a very exciting Allie Finkle giveaway! * A complete set of Allie Finkle books to date, featuring Books 1-6! * A copy of ALLIE FINKLE BOOK 1: MOVING DAY and an Allie Finkle dry erase board and marker. To enter, just fill out the form below -- that's it. The contest will be open until October 26th at 11:59 p.m. ET and I will notify the winners the following day. U.S. addresses only. Good luck! What a wonderful giveaway. My granddaughter would love this. Thank you. I love Meg Cabot, but have never read any of the Allie Finkle series. They sound like great reads! This sounds like such a cute book! I'm glad Booking Daughter isn't too grown up to enjoy it. Hey, darling. Just me, dropping in to say thanks for the e-mail. I've got this posted at Win a Book for you. With several granddaughters and great-granddaughters...I'd love to win this book for them. Wonderful books that are decent for young girls to read. I like that. Thanks for the giveaway and the chance to win this giveaway. I hope I do!